22nd December 2015 – Largest Parkour training facility outside of London. The development of a unique community facility in the grounds of the historic Whitby Park in Ellesmere Port is now complete. 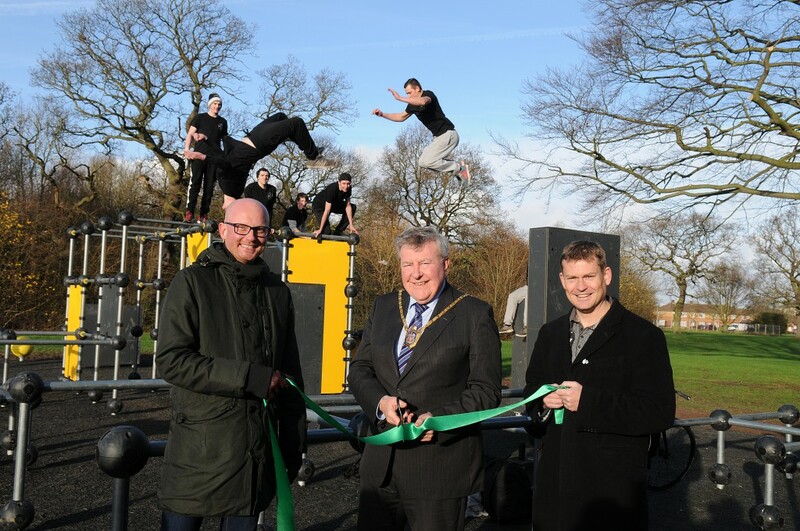 The ground-breaking outdoor Parkour training facility, the first of its size outside London, has been built next to the popular ‘Wheelspark’ skate area providing yet another attraction within the popular Green Flag park. Commonly practiced at gyms and in urban areas that are cluttered with buildings and obstacles, Parkour, or free running, is a form of ‘urban acrobatics’ where participants use the landscape to perform acrobatic movements to get from A to B. The new facility provides an innovative way for people of all ages to keep fit, build strength and stamina – or simply watch the more experienced negotiate the obstacles with speed, fluidity and grace. The £104,000 project, funded through Cheshire West and Chester Council, WREN’s FCC Community Action Fund and Britvic, and supported by Groundwork Cheshire, Lancashire and Merseyside is now open to the public. Mayor of Ellesmere Port, Councillor Lynn Clare, who performed the sod-cutting ceremony to mark the start of construction, said: “This project has been in the pipeline for a couple of years following concerns raised by members of the public about free-running in the town centre. “Since then, we have been working with the Ellesmere Port and Cheshire Parkour Collective to provide a place where experienced free-runners and those new to the discipline can train in relative safety. Richard Smith, Senior Grant Manager for WREN said: “We were delighted to support such a ground-breaking project in Ellesmere Port. This is the £200 millionth project funded by WREN so we are particularly pleased to mark this milestone with an investment in something so unique and innovative. “WREN is always happy to consider grant applications for projects that make a real difference to local communities and having fantastic facilities in such great locations as Whitby Park is really important to people’s health, wellbeing and happiness”.